"Tesla is currently ahead of schedule on both construction and production at the Gigafactory. To date, we have built 1.9 million square feet of manufacturing space and have started production in a portion of the facility while equipment installation continues throughout other areas. As stated previously, we will be building in phases over time and while our original forecast was to begin production in January, 2017, we actually started battery pack production in October, 2015, over a year ahead of schedule." "In terms of hiring, the Gigafactory will employee up to 6,500 people at full production. As we build the Gigafactory, Tesla continues to show an overwhelming commitment to the Nevada workforce. We have gone way beyond the state’s intention that 50% of the Gigafactory workforce be Nevada residents. Nevada residents currently comprise 80% of the construction workforce at the Gigafactory, and each and every contractor at the Gigafactory exceeds the 50% threshold. Additionally, 94% of Tesla employees at the Gigafactory are Nevada residents." 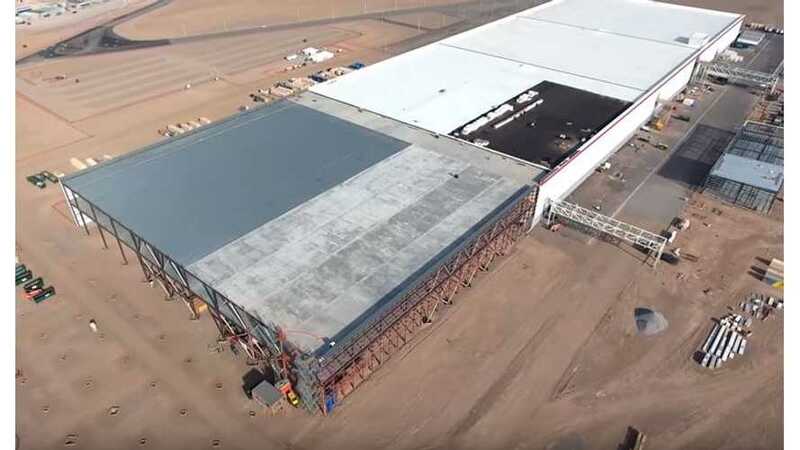 "An update to the first 4k ultra-high-definition video of the Tesla Gigafactory video seen around the world in 2015. Located 15 minutes East of Reno, NV the Gigafactory is growing at a steady pace and helping fuel the strong economic recovery in Northern Nevada. Filmed using a DJI Phantom 4."